The Truth behind George Clooney’s Irish Family History. Using newly available records on www.findmypast.ie renowned genealogist Fiona Fitzsimons discovered Clooney’s Irish ancestors didn’t jump, but were pushed.Clooney’s Irish ancestors were small farmers from Windgap, co. Kilkenny. In the 1850s local farmers competed for land. This sometimes tipped-over into violence. New evidence proves that in 1852 Nicholas Clooney (George’s great x 2 grandfather) was violently assaulted. Months later he was harrased through the court system. “In 1852 Nicholas Clooney suffered a real injustice. He decided shortly after to leave Ireland and settle in Kentucky. “The rest is history.” Says Fiona, Research showed that Nicholas’s widowed mother (George Clooney’s great x3 grandmother) remained behind in Ireland. You can listen to Fiona’s interview on Morning IrelandRTÉ Radio 1 and the truth behind the research by clicking below. UCC Irish Genealogy Summer School is a hit! Eneclann Genealogy experts Fiona Fitzsimons and Brian Donovan both spoke at the UCC Irish Genealogy Summer School last week.”Ancestral Connections is going from strength to strength. Eneclann provides core lectures and Brian Donovan and Fiona Fitzsimons bring academic excellence to genealogical practice-based frameworks”by Lorna Moloney.Booking for the 2015 Summer School will open on 24th July, later this month. 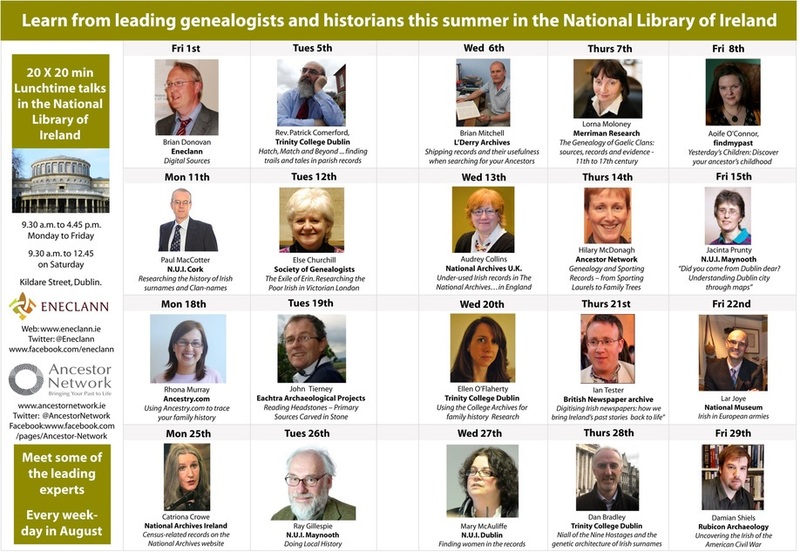 This August at theNational Library of Ireland,Eneclann andAncestor Network will host a feast for family history fans! It’s the return of the Twentyx20 lunch-time talks. Each talk is a short introduction to a key area, source or research method in Irish family history. The Q&A session will give you direct access to the experts. In addition toEneclann, expert speakers at the event will include Tony Browne (local historian), Paul Cotter (surnames expert) Eileen O’ Duill (Civil rights expert), Lorna Moloney (U.C.C Genealogy Summer School & Merriman Research) and Paddy Waldron (Limerick/Clare Expert). Organisations present will include IARC, the LDS, NARA and Roots Ireland.The event has many experts who will be on hand to offer guidance and advice. Brian Mitchell, the best-selling author of A New Genealogical Atlas of Ireland, has a new book out, for anyone tracing their family history in the city and county of Derry/ Londonderry.Tracing Derry~Londonderry Roots was published in the U.S. earlier this year. “Genealogy has great potential to reconnect Derry with its Diaspora and as a promotional tool to potential visitors and tour groups”, says Brian Mitchell. Expert workshops for CPD conclude for the summer. This last week the Expert workshops series concluded for the summer, with two workshops on genetic genealogy given by Dr. Gerard Corcoran. The series of Expert workshops for Continuous Professional Development began in April 2014. Already we’ve held ten workshops, drawing on the expertise of our own GAS membership, as well as overseas speakers including Dr. Liz Rushen (Colonial Duchesses, Fair Game). Monthly Workshops are held in Trinity College and the National Library of Ireland, both institutions with which Eneclann has a close association. These free workshops are open to our own GAS membership, but also to other professional genealogists, enthusiasts and independent scholars. We’re taking the month of August off, but the series will resume in September. “Maeve and I would like to thank all our speakers who generously gave their time, energy and expertise. We’ve had a lot of fun in these first few months, and have built up a regular audience. Debbie Chapman is keen to involve the two local schools in theChapelizod Art Project. She has already completed a workshop with the children of St. Patrick’s National School. This Monday Debbie will hold a free workshop with the children of St. Laurence’s National School. Chapelizod Bandroom,11am -12 pm, Monday 14th July. the Exhibition & Project Book in Sept/Oct 2014. PHOTOGRAPHY (all ages) – email your photos of Chapelizod’s ‘Dereliction’ to info@debbiechapman.com by August 31st. Fujita for inclusion in the Exhibition & Project Book in Sept/Oct 2014. If you can’t find a record of birth in your family’s usual parish of residence, it may be because your ancestors gave birth away from home.Traditionally, many women returned to their mother’s house for assistance when they had their first child. The child may then be registered in their mother’s home parish, rather than the family’s usual place of residence. Another common instance in which a woman gave birth ‘away’ from home, was if she attended the county hospital.The county hospitals shared a campus with the workhouse, and from the 1850s many poor women used it as a ‘lying-in’ hospital. You can make this ‘quirk of registration’ work for you, by searching the baptismal registers of the parish, and from 1864 civil births by the Registrar’s District in which the workhouse campus was situated. This entry was posted in Newsletters and tagged 20x20 expert talks, Brian Mitchell, Chapelizod Art project, Experts Workshops for CPD conclude for the Summer, genealogy tip, George Clooney, Irish family history, latest eneclann newsletter, research, Research tip of the week., The Genealogy event Limerick, The Truth behind George Clooney's Irish Family History, Tracing Derry-Londonderry roots, UCC Genealogy School, World War one Roadshow.